Coming up we'll hear a fantastic interview with Bill Holter of JSMineset.com and the Holter/Sinclair Collaboration. Bill tells us about the implications of dwindling precious metals production in the face of what he believes will be massive worldwide demand. Also, how you'll know when it's “game over” for the dollar. Don't miss an incredibly important interview with Bill Holter, coming up after this week's market update. After dipping to new lows for the year and the lowest levels since early 2010 on Tuesday, gold stabilized Wednesday and closed Thursday back slightly above the $1,080 level. The $1,080 level is significant because that's where gold bottomed in August. As of this Friday morning recording, gold prices come in right at $1,080 an ounce, registering a small weekly loss of 0.4%. Turning to silver, the white metal tested the $14.00 level inter-day on Wednesday, where buyers stepped up to the plate. Wednesday's market action also brought silver back to its August lows. If prices can rally from here, that would put a potential double bottom in play. Silver currently trades at $14.20 an ounce, down 0.7% on the week. As for the other white metals, the platinum and palladium markets are settling down this week after suffering two straight weeks of heavy selling. Platinum is down 0.5% on the week to trade at $859 an ounce, while palladium is up 2.2% to trade at $553. Basically, the Fed didn't drop any bombshells on the markets. The Fed reiterated that it will be data dependent, which we already knew, even as it hinted that it's leaning toward a December hike. Whether Fed officials are crying wolf again or they actually mean it this time when they threaten to hike rates remains to be seen. Some analysts worry that the financial system can't take even a modest interest rate increase. Wall Street and the banking sector have gotten so accustomed to zero-percent interest rates for so long that a hike could trigger a cascade of major disruptive events. That's the worry anyway. Even if there is only a small risk of a systemic financial crisis, it's something that investors need to hedge against and prepare for. Patrick Byrne, the maverick CEO of online retailer Overstock.com, is preparing his company for a financial crisis. His company is stockpiling foodstuffs like those we sell at our Survival-Goods.com store, along with gold and silver coins. According to Byrne, the Federal Reserve has unleashed a giant unsustainable Ponzi scheme. Patrick Byrne: We've turned ourselves into a big Ponzi scheme. I don't think there was even any recovery after '08. It's all been fake. It's been Janet Yellen's magic money machine reflating the bubble. The best we could get with a reflated bubble is this very mediocre recovery. The air is already going out of that, so who knows how long they're going to hold it together. Maybe at worst it's a 10% chance of something deep happening. Imagine there's a bank holiday now. If there's a bank holiday, there's only three days of food in the tip of the supply chain in the cities. There could be all kinds of reverberations and follow-on effects. I wanted to make our company robust so we could survive, say, at least a 30 and maybe as much as a 90-day shutdown of the economy. We've got food that would last all of our employees. Everybody has enough food for at least a month, and actually we could probably stretch it out two months' – or so – full. We have $10 million in gold and silver small coins. Somewhat staggering words to hear from a chief executive of such a large company. At the core of any prepping strategy are precious metals and a three-month supply of non-perishable foods. Byrne emphasized that he's accumulating small gold and silver coins rather than large bullion bars. He wants to be able to actually pay vendors or pay employees with gold and silver, if necessary. As an individual who is building up emergency reserves, you want to make sure your gold and silver bullion provides you with all the versatility and flexibility you may need in a crisis. You might want to cash in with a coin dealer or use your metals directly for barter. You might need to make very large purchases or very small ones. You might need to make change. You might not get any premium for collectible or proof coins in barter transactions. For these reasons, it makes sense to hoard non-numismatic, widely recognized bullion coins and rounds in common sizes. You'll definitely want one-ouncers. You'll also want fractional sizes as well, in both gold and silver. A bag of Pre-1965 90% silver coins is a good way to get widely recognized fractional silver. However, during times when premiums for these no longer minted coins are elevated, which is the case right now, you may be better off buying tenth-ounce, quarter-ounce or half-ounce pure silver bullion rounds. You can round out your emergency money metals stash with some copper bullion – rounds or copper pennies minted in 1982 or earlier. That way, you'll never have to part with more silver than you need to in order to complete a transaction. Even if you think the chances are small that you'd ever need to use precious metals for barter, there's no harm in having the ability to do so. You'll still have some hard assets to your name that will offer long-term inflation protection and can be sold into a highly liquid market for cash whenever you want to ring the register. In the meantime, being prepared will give you peace of mind. There are lots of threats out there. Whether it's a Fed-induced financial panic, or a terrorist attack that knocks out the power grid, or a cyber attack that cleans out the banking system, or something else entirely, we're never more than one rogue event away from the next crisis. And it's better to prepare a decade too soon than a minute too late. And now for more on what a massive debt-based economy may mean for future Fed policy decisions, the dollar, and gold and silver, let's get right to this week's exclusive interview. Mike Gleason: It is my privilege now to be joined by Bill Holter of the Holter/Sinclair Collaboration. Since leaving Wall Street a decade ago Bill has made a name for himself as an astute and highly respected market commentator, and recently teamed up with Jim Sinclair to help others discover the inherent dangers of our debt-based economy and how to protect yourself against it. Well, Bill we've been following you for quite some time, it's a real honor to speak with you and I want to thank you for joining us today, welcome. Bill Holter: Happy to be here Mike. Mike Gleason: To start out here I wanted to set the stage and give our audience some insight into Bill Holter since this is the first time we've had you on the program. You were a part of the mainstream financial world for decades and have a unique perspective as a result, but talk about some of the reasons why you left Wall Street, what drove you to that decision? Bill Holter: It was really one, maybe two reasons. I basically saw what happened in 2007, 2008 was going to come. It was obvious to me, I have worked for a broken for 23 years, I've worked as a branch manager for 12 years, I had enough money to pick up and leave, and I decided to do that because over those 23 years there was never a single lawsuit, or arbitration against myself, and as a branch manager there was never a single arbitration or lawsuit against any of my brokers. I saw the market collapsing, and I figured there would be lawsuits and I just didn't want to be involved with it. The other thing, we actually picked up and left the country, we lived in Costa Rica five years. We left basically because we saw this country changing for the worse, all the Patriot Act stuff, we just decided that it would be best to get out. We lived in Costa Rica for five years, our Spanish got good enough to understand that when a system comes down, when the banks come down, Gringos will be, in our opinion, targets in Latin and South America. So we decided to come back to Texas and live with like-minded people shoulder to shoulder, and deal with it. Mike Gleason: Furthering the point there I know you're a big advocate of holding real and hard assets instead of paper, which is of course what Wall Street is selling to most people. Lately the markets have been making paper look good, the dollar appears strong, stocks are outperforming the metals. So are bonds. How do you respond to people who expect these conventional financial assets to continue to outperform? Bill Holter: They mathematically can't because we reached that saturation in 2007. That was what led up to the 2007, 8, 9, financial crisis. Nothing was changed, nothing was fixed, but what happened was you had sovereign treasuries and central banks around the world pick up the debt baton and borrow. In other words, and I wrote about this yesterday, any Ponzi scheme needs new investors, it needs new money. The way our financial Ponzi scheme works is it constantly needs new debt to continue growing. The way Richard Russell puts it is they have to inflate or die. The Sovereign treasuries and the central banks picked up where individuals and corporations couldn't borrow anymore, so they blew the debt bubble bigger and they reflated. But now we're to the point, and you can see it in the U.S., we're over 100% debt to GDP, the true number is probably 2 or 300% of debt to GDP if you include all obligations. We're to the point where sovereign treasuries can't take any more on. At this point mathematically it will shut down the new debt that needs to be taken on to reflate the economy, and reflate the financial markets. Mathematically it can't go on forever. Mike Gleason: Fed policy decisions and discussions about what they're going to do next unfortunately dominates so much of the conversation in the financial world these days. So with that said I'll ask for your comments on the subject, what do you expect them to do here when they meet in December? Will they finally raise, will they go to negative interest rates, what are your thoughts there? Bill Holter: If you go back two weeks or three weeks, or whenever it was when the Fed had their last meeting. If you remember the two days prior, the Monday and Tuesday, you actually had Fed governors floating the trial balloon of negative interest rates going into that meeting. Then the meeting came along and they basically hinted or eluded to that they're going to raise rates in December. I don't see how they can possibly do that. The whole game has been about taking on more and more debt to reflate the system and the way that was accommodated was by lowering interest rates so that the debt service didn't get any bigger. Now we're at a point where the amount of debt has increased, and they can't raise interest rates because now you're talking about the question of how do they actually service the debt, especially with higher rates?" You also need to add into that, all of these derivatives that are outstanding are based on and have factored in an interest rate assumption. If you start raising interest rates it blows that assumption up and it will put many derivatives offside. It will prick the bubble in other words, it will pop the bubble because you'll have collateral dropping in value and you can't have collateral dropping in value. Mike Gleason: We of course know what they feel about deflation, it's the thing they worry about the most so knowing that I guess we can sort of assume maybe what direction they're going to go with future policy decisions as well, just to try to contain deflation and create a new inflation or reflation from what we're having now, is that kind of part of your thinking? Bill Holter: Right, exactly. It is inflate or die, there can't not be deflation. Because if you have debt evaporating, debt is the foundation to the entire financial system. If you go back to the 1930's you had gold as the foundation to the financial system, you had a real asset. Now you don't have a real asset as a foundation, the foundation is debt. You can't have deflation otherwise the debt starts to evaporate and it becomes a self-fulfilling circle down the drain. Mike Gleason: The dollar remains the world's reserve currency and lately it's been looking pretty good relative to it's competition, the other fiat currencies out there. But we know there are some cracks in the foundation for the dollar, we see nations such as Russia, Iran, China, Brazil, writing trade deals for gas and oil in other currencies other than the dollar, do you expect the dollar to hang onto its exalted status, and what are the ramifications if these non-dollar based deals persist in the international trade market? Bill Holter: It basically takes demand away from dollars. You've seen it over the last two years, you've seen deal, after deal, after deal, being done to the exclusion of dollars, which means there's less demand. You also look at the oil price, remember the petro dollar had been supported by the OPEC nations, by Saudi Arabia recycling dollars back into treasuries. Now you've got lower demand worldwide because the global economy is slowing, and you also have the price of oil down from well over a hundred dollars a barrel to forty dollars a barrel, there's a 60% drop. There's a decrease in demand for dollars. To answer your question long term, no. The dollar is not going to remain the world's reserve currency. It can't be, and the rest of the world doesn't want it to be, led by China and Russia. Mike Gleason: There's obviously a lot of question about how much gold is left in Western vaults just looking at the numbers posted by the Comex for all to see in terms of available inventory in that exchange, it's just staggeringly low. Just how much gold is left? We know there's a finite supply of gold in the world so this mass exodus of gold from Western vaults being sent over to China, I mean that can't go on forever right? Bill Holter: It has to be close to an end because even if you just use a pencil and a piece of paper you can figure out that China has accumulated at least eight to ten thousand tons of gold, and that happens to be the amount, 8,300 tons is what the US has said ever since 1971 that we have. We've also not even had an audit since 1956, so who knows. It may have already been emptied a while ago and maybe it's foreigners gold, custodial gold, that's been sent to China. China is basically taking up the entire world production on their own, they're importing that each year. They're importing 2,400 tons per year, and that's basically what the world produces if you subtract Chinese and Russian production. Mike Gleason: If we had a situation where all of a sudden we couldn't deliver gold that they were asking for, what would be the fallout of that? Bill Holter: That's game over. I've said all along that when the last ounce is delivered, (or) when the first ounce doesn't get delivered that's been contracted for and paid for, it's over. You'll see a massive collapse in the dollar, and you'll see foreigners not willing to accept dollars for trade. Then the U.S. is going to have to live on what we produce and we don't produce much in the way of everyday goods. I mean you go to Walmart, there's nothing in Walmart, very few items are made in America anymore. So it's a big problem, once the gold doesn't get delivered, it's game over. You'll see force majeure in Comex, LBMA will be cleaned out, we'll find out who's been swimming naked in the ETF pool, we'll get to the truth at that point. Mike Gleason: The Chinese are very forward looking people and it's been documented many times about their extensive planning, really decades or maybe even centuries out. So it seems very reasonable to me to believe that they have a plan and something bigger in mind with this gold accumulation strategy. In your mind is that fair to say? Bill Holter: Of course. They are a people that look out generations, they look out a hundred years ahead. I believe that they've been accumulating gold because, go back to 1971, Mao said in 1971 that that's it for the West. They've got to fiat currency and their currency will fail. They look far out into the future, the big accumulation that you've seen over the last five to ten years basically in my view has been preparation by the Chinese as a hedge against dollar losses but also they've accumulated real wealth, and everything else will evaporate around it. Mike Gleason: Switching gears here a little bit, you obviously follow the mining sector very closely, what are you seeing there and what are your evaluating potential future moves in bullion prices, what do you look for from the miners? Do the miners lead the way for the bullion, is it the other way around, what are your thoughts there? 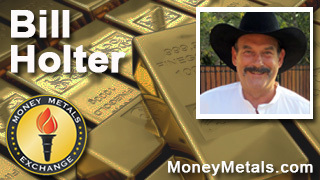 Bill Holter: From a timing standpoint I don't know which leads which, whether silver leads gold, or the miners lead silver, or what have you. What I do know is if you go back to 2006, 7, 8, you had gold in the $700 to $800-900 range and miners were being valued at – exploration companies that had gold in the ground – they were being valued at basically $100 per ounce. You look today, some of those very same companies that have actually put money into the ground, done further drilling, proven their reserves up further, they're selling for $10 an ounce, yet gold is higher. So miners right now are stupid cheap. Mike Gleason: I know you're a big proponent of sound money as we are, we are seeing some of the Republican candidates criticizing the fed and talking about sound money issues, but they simply may be pandering to people who have supported Ron Paul in the past. It's hard to know how many of them are serious about that issue. What are your thoughts, is there any change we're going to see reforms out of Washington DC with respect to our money? Bill Holter: Not until they're forced to. I don't see any way that we'll get reforms until the markets force them to, meaning some type of crisis. That's how the country has been managed for years and years. We react to crisis rather than foresee crisis and act ahead of time. Mike Gleason: It will certainly be interesting to see if more and more get their eyes opened to what is really going on with this debt based monetary society, obviously it does have an exhaustion point you would think, but yeah I agree. At some point it's not a decision that they'll make willingly, it will be forced upon them. Now the big question, and maybe you eluded to it a few moments ago with potential blow up of Western vaults, and LBMA, and Comex being completely drained. What's it going to take to get the metals moving to the upside again, we've been mired in this corrective phase for quite some time, several years now and it's gone on longer than anyone would have expected. Now we both probably agree that markets, especially commodities and metals markets are highly manipulated, so do you see any sort of event taking place that will break the current down trend? Bill Holter: I look at it as more than likely it's going to be a supply problem. If you look at next month I think there's something like seventeen or eighteen million ounces on Comex that are contracted for, yet they've got less than five tons total, call it 150,000 ounces total in their registered category available to deliver. You're talking about just a couple weeks away. Yes, in the past the open interest has bled down and much of the gold, paper gold, has been settled in cash. December is typically thee biggest delivery month, and we've got the biggest delivery month hitting at a time that their registered inventory is at an all-time low. I mean you've got a 150,000 ounces or thereabouts in Comex available, registered for delivery. It could be something like that, it could be something like a blow up of a Glencore or something. I've said that I believe Glencore is a blasting cap to Deutsche Bank's derivatives book. So if you had Glencore collapse, and then stick Deutsche Bank with a bunch of upside down derivatives, now you're talking about Deutsche Bank with $73 trillion dollars' worth of derivatives. So it can come from any direction, but I think it will end and be seen as a supply problem of physical gold. Bill Holter: It will be like a light switch, I think. I think you're going to see gold moving hundreds of dollars per day. At the beginning of last year the Comex put collars on gold, in other words it couldn't trade up or down $400 dollars per ounce. Now why would they have done that? What could they possibly have seen for them to put a four hundred dollar collar on gold? Mike Gleason: That seems like quite a move, I guess that's something they must be expecting to happen at some point. Bill Holter: Yeah, and they put that into their exchange rules, I think it was January or February of this year, early in the year. Mike Gleason: As we begin to close here Bill, what would you have to say to the beleaguered precious metals investor who's seen the metals just mired in this difficult downturn over the last several years, what do you have to say to somebody who might be thinking about jumping ship, it just doesn't seem like it's been very fruitful for them. What do you have to say to that person? Bill Holter: I would just say stand tall, use your own common sense, believe your own gut. Why did you buy into metals in the first place? You did it as an insurance policy, and it's pretty obvious that things are not going right in the financial markets. You can see the debt build up, you can see the collapse on the horizon. If you have the ability I would buy more, you're buying below the cost of production. And the cost of production is not going to be declining from here. All the low hanging fruit of gold and silver, the easy gold and silver has been mined over the last 20 to 30 years. So production is not going to be increasing, production is going to be decreasing. In the event of a full-blown crisis where confidence is broken, capital is going to be screaming towards silver and gold. Bill Holter: Well Mike ask yourself this, "How much is something worth if you can't have it?" Mike Gleason: Almost an infinite amount really. Bill Holter: Right, and I mean look at versus the dollar. We get into a point where we do have the financial markets melting down and deflating, that is going to wallop the dollar, and the dollar will ultimately go away... every fiat in the history of history has gone away. So using zero as a bound, how much is a cup of coffee in dollars as the dollar's collapsing? There's your hyperinflation. They don't even need to print anymore, it will be based on the value of the dollar itself. Mike Gleason: Yeah it should be very interesting to watch play out and it's great to be able to talk about these sort of things with you, I'd love to have you on again and certainly appreciate your insights, I really enjoyed it. Before we let you go can you tell our listeners a little bit more about what you're doing there with Jim Sinclair with this Holter/Sinclair Collaboration and how they can get more information about that. Bill Holter: My work is published at www.JSmineset.com. There's probably a dozen websites that publish my work, and we just got done with our first conference. Jim had gone quiet for a year thereabouts, and we did a conference in LA and we plan to do maybe a conference a month this coming year throughout various cities. Mike Gleason: Definitely urge people to take a look at that. JSmineset I guess would be of course where they could find information about that, Bill those upcoming events? Bill Holter: Right, yeah. All of the conferences will be announced on Jim's site. Mike Gleason: Well excellent stuff again, thank you so much for taking time out of your busy schedule, we really appreciate it and I hope you have a great weekend. Bill Holter: You too it was my pleasure Mike. Mike Gleason: That will do it for this week, thanks again to Bill Holter, again the site is JSmineset.com, be sure to check that out for all of the great commentary Bill and Jim put out there on a regular basis, and then of course information about those upcoming seminars for 2016, JSmineset.com. And check back here next Friday for our next Weekly Market Wrap Podcast, until then this has been Mike Gleason with Money Metals Exchange, thanks for listening and have a great weekend everybody.